Only two period mentions have been available that refer to the royal library of King Matthias Hunyadi by a name of its own. One of them can be found on the frontispiece of Philostratos-corvina (Budapest, OSZK, Cod. Lat. 417. ), and it refers to the collection as Corvina Bibliotheca, in line with the additional name of the king (Corvinus). The other mention can be found in the title of the poem written by Florentine humanist Naldo Naldi on the laudation of King Matthias’ library, referring to it as Augusta Bibliotheca. However, probably neither of these names were commonly used in the royal court of the Hungarian king. 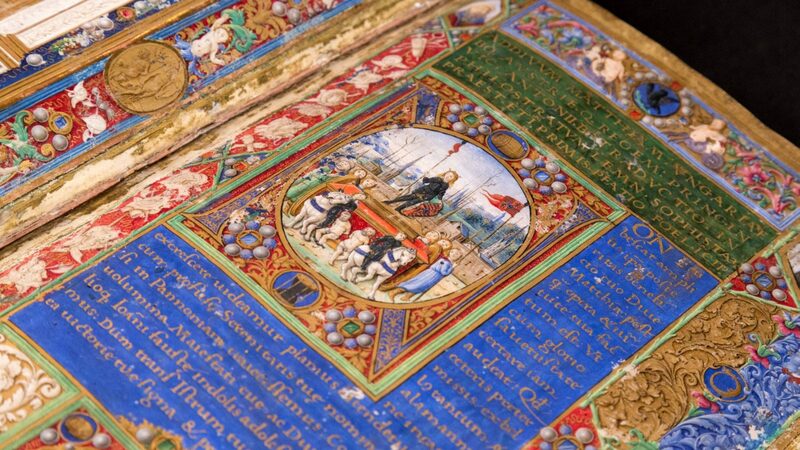 Under the term corvina, research understands books, about which it can be proved, in one way or another, that they had once belonged to the library of King Matthias Hunyadi and /or Queen Beatrix, or that the book was possibly part of some other representative stock of the palace. Included in this term are also the codices possibly used in the palace chapel, such as the Gradual of King Matthias (Budapest, Cod. Lat. 424. ), or the Evangelistarum of Holkham Hall (Holkham Hall, Library of Lord Leicester, Ms 18). Items painted over with the badges of King Ulászló II are also regarded as corvinas. 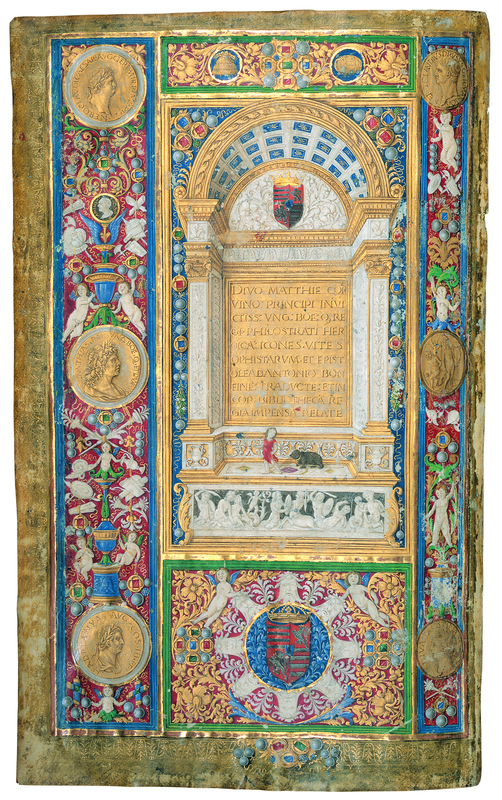 The most characteristic corvina criteria are the coat-of-arms of King Matthias and/or Queen Beatrix on the frontispiece of the codices, as well as the so-called corvina binding, that can be velvet or gilded leather. Other corvinas do not display these features but, by using philological, codicological or historical arguments, it can be proved that they had been parts of the afore-mentioned collection. This is mainly characteristic of the Greek corvinas, but the Latin-language “corvina” stock, which has remained hidden due to the lack of the characteristic features, must have been significant as well. In the course of research, “corvina classification” has also been assigned to several books that had been made, and had been part of the royal library in Buda only after King Matthias’ death, during the reign of King Ulászló II: One such example is the Petancius scroll (Budapest, OSZK, Cod. Lat. 378. ).